In the social sciences, humanities or arts it is largely impossible to substantiate statements on research excellence with reliable indicators for international benchmarking of fields and institutions. 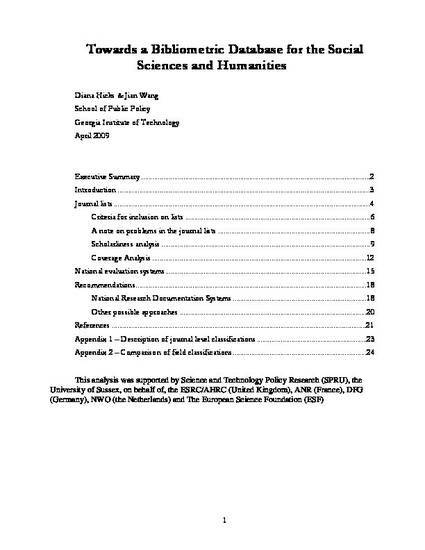 To help overcome this limitation, this report examined bibliometric systems in the social science and humanities from the perspective of assessing their potential for institutional research evaluation nationally or internationally. To assess the feasibility of an adequate bibliometric system in SSH, we must ask: how large is the SSH literature and how much of it should be counted in an evaluation? Working with limited time and resources, our efforts focused on assessing international and national journal literature using multi-disciplinary resources often used in evaluation and also ERIH. A comparison was made between six journal lists: Ulrich’s, ERIH, the Norwegian reference list, the Australian ERA Humanities and Creative Arts list, WoS and Scopus. The analysis uncovered a set of issues that would arise in any attempt to establish a comprehensive database of European SSH scholarship.